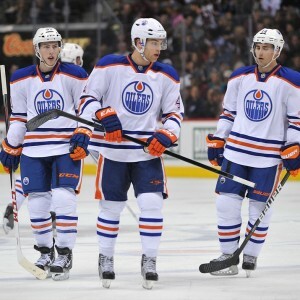 Is it Time for the Oilers to Rebuild Their Rebuild? The fans are disappointed. Peter Chiarelli is disappointed. Todd McLellan is really disappointed. Even though we all knew change wouldn’t happen overnight, finishing last or close to it wasn’t the plan either. Injuries have taken their toll, yes. But the Oilers pitiful 5-0 loss at the hands of the lowly Flames was a microcosm of their season. There have been marginal improvements, but it’s alarming that McLellan is calling out the team’s work ethic. Meaningless games or not, for players who know they could be shipped out-of-town, the compete level left much to be desired. Wouldn’t you want to put in your best effort to impress other teams? Or on the flip side, wouldn’t you want to show the Oilers that you’re worth keeping around? Playing in a losing environment for so long has taken its toll on this young core, to be sure. The scary thing is, we don’t know if this atmosphere can really change without the insertion of new blood. Maybe they need some really solid veterans to straighten out the room. Maybe they need a change in the leadership structure. Maybe these guys can work together, but only with the help that they’ve never had. The coaching isn’t the problem. It can’t be, not after all these years and all these different voices. The onus is on the players now more than ever, and they need to show whether or not they have the fortitude to make it. “I’ve seen improvement in a lot of areas, then it comes back in. It’s like a disease that you think you have cured, then it reappears. You have to go back and eradicate it, get it out of your system.” – Coach McLellan. So one step forward, two steps back? I suppose that’s better than nothing improving. Knee-jerk reactions aren’t going to work, although you’d have to think the Oilers management has been spending a lot of time considering this roster. 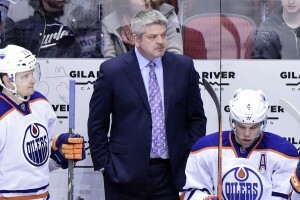 McLellan used the word ‘disappointment’ and ‘disappointing’ several times when describing his team’s play. I’m sure some guys mail it in this time of year, but for this group, they can’t afford to let their guard down. They have spent enough time dealing with losing. Hockey players have a lot of pride. That’s why while organizations may try to tank, the players don’t always co-operate. No one wants to lose. No one wants to be the worst. There is too much competitive spirit in athletes. So of course it’s concerning that the Oilers are lacking in the work ethic department. regardless what time of the year it is. We’re not talking about a team who has recently played for a Stanley Cup, or who has already qualified for the playoffs. There is no room for coasting in Edmonton. No one has earned the right to take even one shift off. So now what? The coach isn’t going anywhere. They’re building around Connor McDavid. They need to bolster their blueline. Nail Yakupov wants out, and they won’t get much back for him. The question is, in order to cure the disease that plagues the Oilers, is an upheaval of players needed? If the core players like Taylor Hall, Jordan Eberle, and Ryan Nugent-Hopkins are the problem, do you have no choice but to move them? Understand this when you’re talking about trading young players. Unless it’s a one-for-one like the Jones/Johansen deal, more often than not, you lose the trade. The Oilers are dealing from a position of weakness. Do other teams even want to take on these players? Don’t think for a second that GM’s around the league aren’t watching the Oilers closely to see how the players respond to adversity. So far, the Oilers are failing the test. They wouldn’t have a problem moving a guy like Hall, because he’s a proven commodity. But do you get equal value back for him? And then who replaces him? The Oilers don’t need any more draft picks or players who aren’t ready for the NHL. If that’s what they’re after, then I guess the rebuild is starting over. Justin Schultz, Jeff Petry and Devan Dubnyk weren’t the problem, because they’re all gone, and doing well in new places, while the Oilers are still terrible. The failure in Edmonton really is a virus, and the maybe guys who you think are causing it are actually just casualties. To cure a disease, you have to get to the root of it. From now until the start of next season, that’s exactly what Oilers management will try to do. At this point there’s no telling whom the next victim will be.